Last night's meeting of Newmarket's Committee of the Whole voted 7-1 to reject Bob's Forrest's original application for a seven storey condo on Main Street in the heart of the Town's Heritage Conservation District. By the same impressive margin the Committee rejected the so-called "compromise" recommendations of their own planners which would have capped the redevelopment at five storeys on Main, with set backs, and seven storeys on Park Avenue, also with set backs. 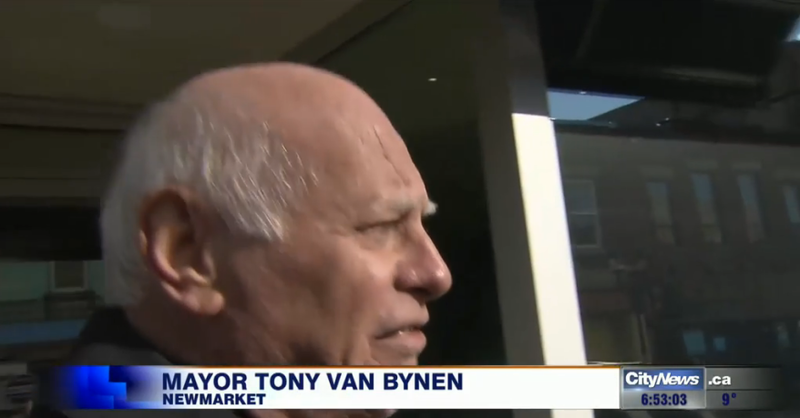 The Mayor, Tony Van Bynen, who said Forrest's condo was a great example of the type of intensification the old downtown needs, was left isolated. The councillors' decision, which will be ratified at the next meeting of the Council on 5 December 2016, drives a stake through the heart of Forrest's condo and kills it stone dead. So, where does this leave Forrest's appeal to the OMB? He has spent years sweet-talking the OMB, telling the Board the municipality would make a decision in his favour. That has now gone pear-shaped and the Board will be chasing Forrest for answers after the Town's Council meeting on 5 December 2016. The OMB Order of 19 August 2014 excluding the Forrest Clock Tower lands from the Heritage Conservation District did not say this should be in perpetuity. It would apply until Forrest's planning application had been determined by the municipality. Forrest can now reactivate his sleeping appeal but to what purpose? The OMB cannot force the Town to sell or otherwise make its land available to Forrest. Forrest has only two options: bring forward another application respecting the Council's policies or sell the land and move on with his life. The deputations against the Forrest development were all of exceptional quality. And they are now on the record and video archived. Some deputations told stories that were deeply personal, recounting the impact that Forrest's actions had on their lives. What happens now to the business people who were evicted by Forrest using a demolition clause in their lease to kick them out? The record of the Town's planning department is woeful. It needs a good shake-up. Important information raised by members of the public at the Statutory meeting in May and in correspondence were not followed up or otherwise ignored. Some of these issues were critically important if, at times, a tad technical. In May, councillors and staff were told the Forrest development was way too dense for the tight site. Planners use a tool - the floor space index - to measure density. To calculate the FSI the gross floor area of the development is divided by the lot size. Forrest said his FSI was 2.9 whilst acknowledging the Town's Zoning By-law stipulated 1.0. Forrest used the underground car park area (belonging to the Town) to massage his FSI figure downwards. Had he excluded the underground area, the FSI would have been way over 4 indicating a development with massive density. The planners did not reference this once in all the years they have been dealing with the Forrest applications. That is, perhaps, one of the more egregious omissions but there are many others. They chose to rely uncritically on the partial and discredited opinions of so-called "heritage professionals". At no stage was any consideration given to the architectural merits or historic significance of the historic commercial buildings earmarked by Forrest for demolition. When the planners told us the amended application "would not negatively impact the heritage attributes of the district" we all enjoyed a belly-laugh. We could see with our own eyes how damaging the development would be to the historic downtown. Last night, we were asked to suspend our critical faculties in the face of advice from heritage professionals. Only the credulous fell for that. The Town's planners knew the work of the "peer reviewer" ERA Architects was seriously sub-standard but said nothing. The terms of ERA's contract with the Town obliged them to take into account the Town's existing heritage conservation district policy when offering their considered opinion. The policy was ignored. All that mattered was facilitating the proposed development and seeking out "mitigations". This morning the Mayor is a much diminished creature. But at least he explained his position at the end of the meeting - something he never did with Glenway. Van Bynen told us there was often opposition to new proposals but his way is to hold fast and take the flak. People would come round in the end. They didn't. With the Clock Tower he seriously underestimated the opposition. In his closing remarks he congratulated us all on being "respectful". In Van Bynen's world, "respect" trumps everything else - even being economical with the truth. "and throughout the entire Heritage Conservation District with a fourth storey subject to certain conditions". We shall see how this plays out. Like many others, I am not persuaded and need to be convinced. The veteran councillor Dave Kerwin burned his boats with Forrest by seconding Taylor's motion to deny the application and the planners' amended version. Tom Vegh said Main Street was unique and should be protected while not putting it under a glass bubble. Jane Twinney said the proposed development didn't fit in. And she was concerned about approval establishing precedents. Kelly Broome told us of the value heritage brings to townscapes. She was not convinced Forrest was the answer. Christina Bisanz wrestled with the issue, believing at the outset the existing 3 storey maximum should be retained. She ended up supporting Taylor's motion giving a long list of detailed reasons why. Ward 5 councillor Bob Kwapis said Taylor offered clear direction and would support him. He said he would be bringing forward proposals to deal with the blight of empty stores on Main. And back to the deputations. John Heckbert focussed on the land swap. He said the development could not go ahead without it. Ann Campbell on behalf of Julie Cochrane talked about the potential adverse impact of the proposed development on the arts community and culture. Glenn Wilson said the development would set back the downtown business community ten years. Jone Wright, of Lemon and Lime on Main Street, told how she had lovingly restored 194 Main and that the basements are not crumbling. Jone Wright, speaking on behalf of her husband, David Hunter, said he felt betrayed by Forrest who had forced them out of 194 Main Street on a "demolition" clause. Forrest is not "community minded". Margaret Davis told us 300-400 people would have their lives turned upside down by this "monstrous development". She was one of many to point to the recent "People's Choice Award" for the best Main Street in Canada and the irony of the situation. Gerald Fox took us through the intricacies of garbage removal, asking if we wanted Market Square to be turned into a waste transfer station. Chris Howie said Main Street did not need to be "saved". He reminded us of the two years it took the Council to bring the Heritage Conservation District By-law into effect. The development was not appropriate for Main Street but would be OK on Davis or Yonge. Siegfried Wall told councillors they should defend their own Official Plan. He said the actual FSI was 4.27 not the 2-9 Forrest claimed. The development would be a "mis-fit" in the historic downtown. Ted Heald made a very spirited contribution focussing on the role of the planning department. The public expects more transparency. Tracee Chambers, Ron Eibel and Darryl Wolk all spoke as former Ward 5 candidates. They told us people they talked to in the recent campaign wanted the 3 storey cap protected. Bill Wolske said the new must respect the old. The proposed development would diminish and degrade the cultural heritage. Elaine Adam wanted intensfication to go where it belongs - on Davis and Yonge. Glenn Wilson, on behalf of Jude Lauzon, spoke about the potential damage to businesses and residents arising from the diversion of water flows during and after construction. Anne Martin, a business owner on Main for 34 years, reminded us of the fragile nature of the rubble stone foundations on which Main Street is built. Atholl Hart, the Chair of the Town's Heritage Advisory Committee, in a rousing finale, said our heritage was worth preserving and nurturing - especially with so many people now researching their roots and where they came from. Historic buildings - in their entirety - have their own stories to tell and retaining facades is not enough. There were a handful of contributions from people in favour of the development. Trinity United Church, in a letter from their lawyers, came out opposed to the original application and to the amended proposal from the planners. The Church feels the scale of the proposal is still not compatible with the historic character of Main Street "and oppose its approval".